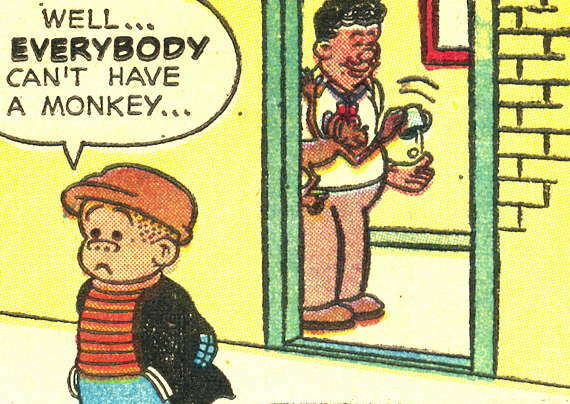 No Sluggo, don’t say that!!! The Beatles said it best. There’s nothing better than a Sluggo Saturday with a monkey! I suppose that “Peanuts #5” was really an anthology of newspaper strips in comic book format. However, I prefer to imagine a peculiar crossover event where the kids from “Peanuts” and “Nancy” met each other and had an adventure involving monkeys. damanoid – The Dell Comics Peanuts comics usually featured a back-up Nancy and/or Sluggo story. And Peanuts had original stories, if I remember. Some of them were kinda nuts. It’s hard to watch Sluggo give up on his dreams like that.